However, before April is over the same Word, Excel, and PowerPoint universal apps will make their way to the Windows 10 preview for phones, which itself was released a couple of months ago. The universal apps are tailor made for touch-based interfaces, so they should be quite useful on smartphones running Windows 10. On such handsets, they adapt to the smaller form factor, with commands and controls being placed at the bottom of the screen for easy one-handed use. 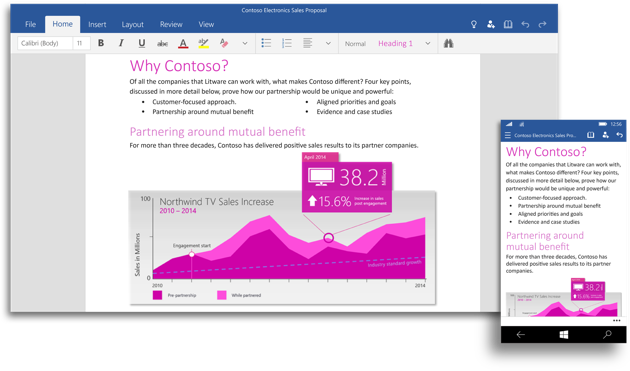 These Office apps are optimized for viewing, quick edits, and notes. It’s important to note that the upcoming release of the Office universal apps for Windows 10 for phones will itself be a preview, so some things may be altered in the final release, which should coincide with the consumer launch of Windows 10.